There were no traditional ceremonies in Winnipeg in 1967. "You've come a long way, Pan Am," says Jordan Wheeler. When visiting indigenous territory that isn't your own, the protocol is to acknowledge whose territory you are on and thank them for allowing you there. If done properly, they welcome you in return. 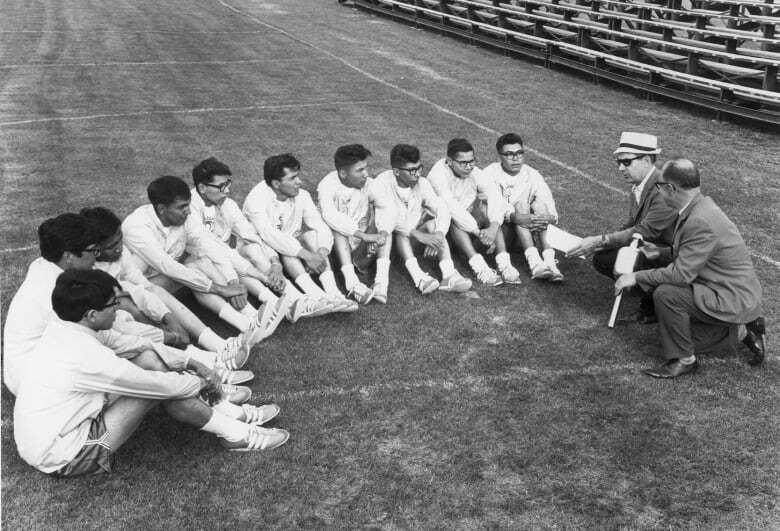 That protocol was not adhered to when athletes from across the Americas converged on traditional Cree, Ojibway and Métis territories for the fifth Pan Am Games on July 24, 1967, in Winnipeg. The only indigenous participation that day involved pancakes. To refresh, the torch for the 1967 games would be relayed from St. Paul, Minn. Ten indigenous young men, the Frontrunners, all track and field standouts at their respective residential schools, were chosen to run the torch to Winnipeg. The five-day, 800-kilometre odyssey led to the gates of the Winnipeg stadium where they were told to hand the torch over to a non-indigenous runner who carried the flame inside. As the crowd cheered, the Frontrunners were taken to the old Pancake House at Polo Park for breakfast and subsequently shipped back to their respective residential schools. Aboriginal teenagers brought the torch from St. Paul, Minn., to Winnipeg, only to have a white athlete take the glory lap in 1967. (Canadian Press)Thirty-two years later, Manitoba apologized for that transgression and seven, surviving Frontrunners participated in the opening ceremonies of the 1999 Pan Am Games. The younger Dave Courchene held the torch as they entered the Winnipeg stadium in ceremonial canoes. As Charlie Nelson would later say, they "finally got to complete the journey." The gesture was a step in the right direction but the Winter Olympic Games in Vancouver in 2010 went further. Organizers recognized that the event would be taking place on the shared, traditional territory of the Lil'wat, Musqueam, Squamish and Tsleil-Waututh and those "Four Host Nations" became the first Indigenous Peoples ever to become equal partners in planning and hosting an Olympic event. A couple of months before the 2010 Winter Olympics, the city of Toronto and southern Ontario were awarded the 2015 Pan Am Games. Following Vancouver's lead — given that the bulk of the sporting events will take place on traditional Ojibway territory — the Toronto 2015 Pan American/Parapan Am Games Organizing Committee (TO2015) signed a protocol agreement last May with the Mississaugas of the New Credit First Nation (MNCFN) who became the official host First Nation of the Games. The Six Nations of the Grand River, the Huron-Wendat First Nation and the Métis Nation of Ontario signed memorandums of understanding with TO2015, recognizing their involvement in the Games, bringing the number of host nations to four. But when the athletes arrive, it will be the Mississaugas of the New Credit First Nation that welcomes them. Chief Bryan LaForme stated in a press release that the games represent, "a once-in-a-lifetime opportunity to showcase the roots, language, traditions and culture of the Ojibway and to promote respect for and recognition of Indigenous Peoples across Canada and the Americas." The Honourable David Peterson, chair of TO2015, added the relationship, "demonstrates the importance TO2015 and its partners place on ensuring Aboriginal Peoples have meaningful involvement in the games — and that the games are a catalyst for the further future positive development between aboriginal people and Canadian society." 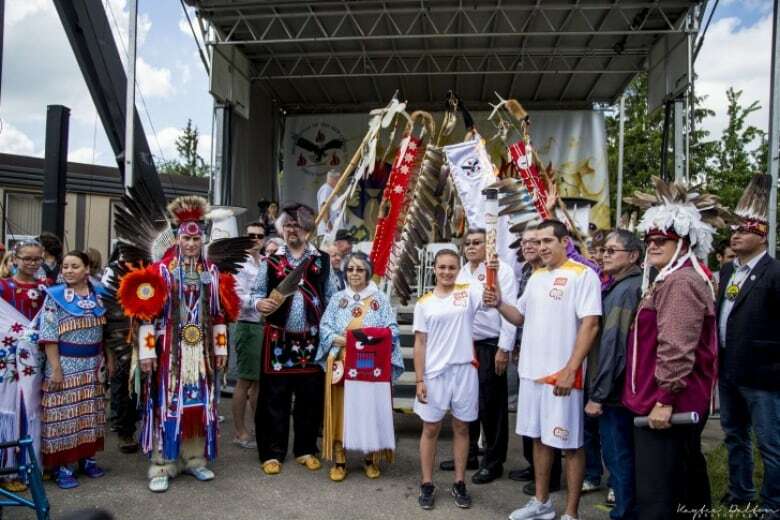 The Mississaugas of the New Credit First Nation officially welcomed the flame to the Official Host First Nation community at a June celebration. (Mississaugas of the New Credit First Nation)Peterson's words sound like a Truth and Reconciliation Commission of Canada (TRC) recommendation and one hopes the proof will be in the pudding but so far, so good. Among other duties, MNCFN will host the Aboriginal Pavilion that will be sure to attract a large number of visitors. The Indigenous Pavilion at the Vancouver Olympics attracted more than any other. Indigenous involvement in the Games extends well beyond Canadian soil, however. This year's torch relay began at the Pyramid of the Sun at Teotihuacan, Mexico, with a ceremonial lighting of the torch by the Aztecs. LaForme and MNCFN elder Garry Sault were in attendance. 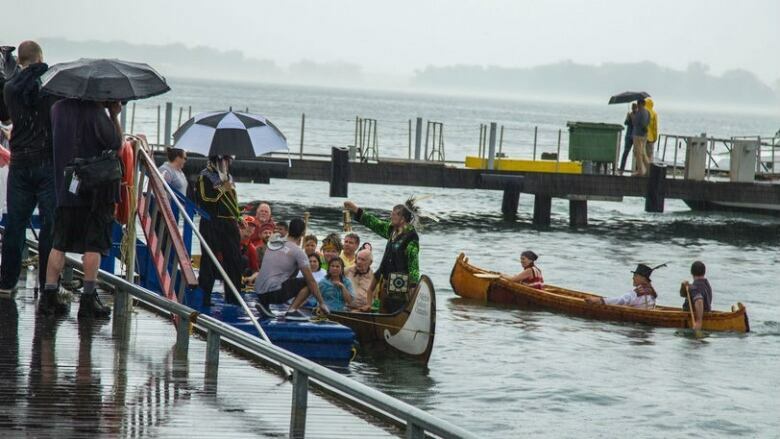 The flame was flown to Canada and taken to Harbourfront Centre where it was met by canoes filled with members of the four host nations. LaForme was the first to receive the torch and in his speech he encouraged people to "embrace the spirit of healthy competition, and embrace the spirit of kinship with each other and our ties to the earth." And so began a 40-day journey. The flame was taken to 130 communities across Ontario and Canada. Day 20 of the trek saw the flame reach the Mississaugas of the New Credit First Nation community itself. A day-long celebration was co-hosted by Ron MacLean and Waneek Horn-Miller and the community was particularly honoured that original Frontrunners Charlie Nelson, Bill Chippeway, Charlie Bittern and William Merasty were in attendance. The four are also scheduled to participate in the opening ceremonies in Toronto on July 10. Officially kicking off the 2015 Games that morning will be the traditional Three Fires Ceremony (Three Fires refers to the Three Fires Confederacy which includes the Ojibway, Odawa and the Potawatomi nations). There were no traditional ceremonies in Winnipeg in 1967. Just 10 Indigenous teenagers sent for pancakes. You've come a long way Pan Am Games ... a long way. Jordan Wheeler is a Gemini award winning writer living in Winnipeg. His journalistic work, over the last 30 years, has appeared in various publications across the country. 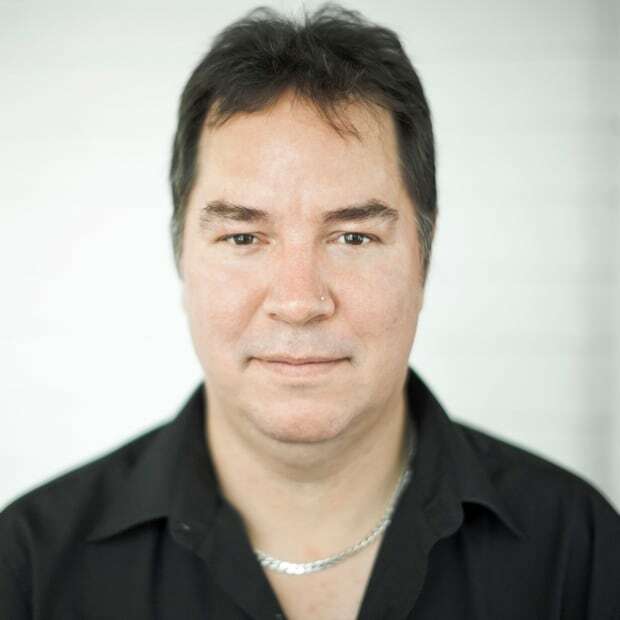 He is also a member of the George Gordon First Nation in Saskatchewan.